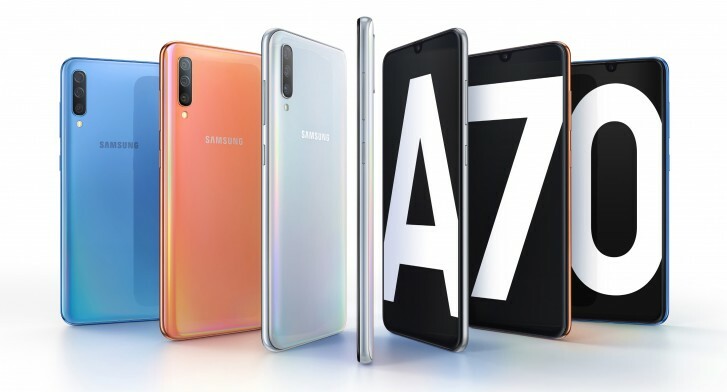 Samsung just announced it's new player in 2019 Galaxy A- Series the new Galaxy A70. Phone comes with a large 6.7-inch full HD+ Super AMOLED Infinity-U display with In Display fingerprint scanner along with 20:9 aspect ratio. It runs on Android Pie based One UI 1.1 and will receive Android Q update later this year. The Galxy A70 is powered by an octa-core processor (Dual 2.0GHz + Hexa 1.7GHz) paired with 6GB and 8GB RAM options. Internal storage is at 128GB with the option to expand further via microSD card (up to 512GB), with a dedicated slot. 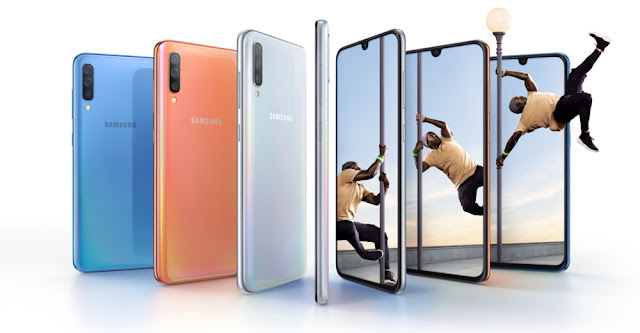 Samsung Galaxy A70 sports a 32-megapixel sensor with f/1.7 aperture, an 8-megapixel ultra-wide sensor (f/2.2 aperture, 123 degrees), and a 5-megapixel third depth sensor (f/2.2 aperture) as well. Up front, there is also a 32-megapixel selfie sensor with f/2.0 aperture. Galaxy A70 packs a 4,500mAh battery with support for Super-Fast charging at 25W also includes Samsung Health, Samsung Pay, and Bixby along with face Scanner too.